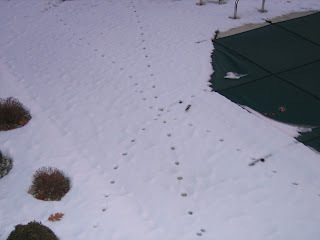 Prints in the snow in my backyard - not made by the dogs (they don't have access to this area in the winter). Was it 6 one-legged cats? Perhaps 3 cats with a wide stance tapping their feet? Did something get stuck in the pool last fall, mutate, and crawl out from under the cover? Very weird and very interesting. Reminds me of the kid out in the snow in The Shining. He stepped backwards into his tracks. That movie is so creepy. Now I'm definitely not going out there at night, just in case.